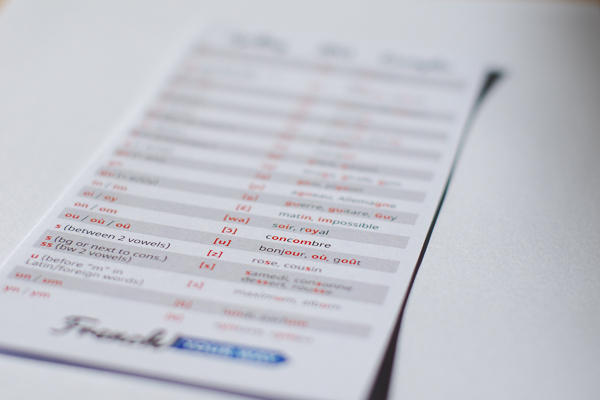 This bookmark is a clever quick reference tool to help beginner students read French by looking up how to pronounce a given spelling. Use it on the go in your French textbooks or novel! 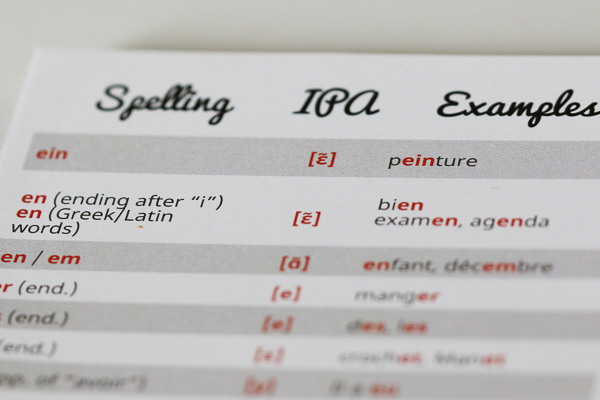 The bookmark compiles the main combinations of letters which students of French need to remember and their corresponding pronunciation in IPA (International Phonetic Alphabet). The IPA (International Phonetic Alphabet) symbols are important because they’re the only reliable indicator for the correct pronunciation of words. While you don’t have to learn the phonetic symbols by heart, it’s therefore a good idea to be able to refer to them. A single page PDF file featuring the bookmark. Simply download and print. When you buy this product, you’ll receive a digital version of the bookmark to download and print. The bookmark can be used alone or as a complement to my course “How to sound like a native French speaker”. I’ve worked with a talented Canadian designer to create this unique bookmark for you. I hope you’ll love using it in your French books!